We've been gone from Kansas now just shy of two years and there are still some things that we miss. Enjoy these 7 quick takes of things that we just can't replace here in South Bend! 1. An empty mall. Less than 5 minutes from our condo was a mall that had Sears, Macy's, a cat store and a whole bunch of empty space. One of our favorite things to do as a family was to head to the mall after dinner to look at the cats (it's where we adopted Juliet) and then run the hallways! 2. Deanna Rose Farmstead. 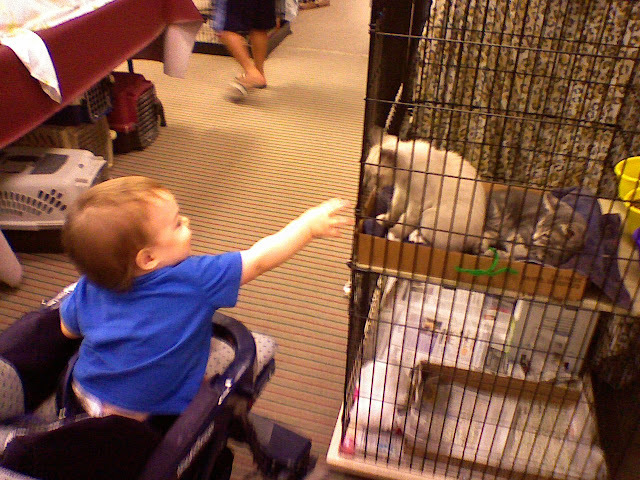 The kids loved seeing, petting, and feeding all the animals. Although we do have a small zoo close by, it's not the same experience. Blaise loves the sheep the best! 3. Our church. It had both a strong liturgy and a strong kids program. We've been looking, but haven't found anything that even comes close here. 4. Thrift stores that actually have nice things. Within walking distance of our condo was a thrift store that was clean, well organized, well lit, and the toys typically had all their pieces! There are 4 thrift stores within 10 minutes of our house here and I have yet to find a toy with all its parts! 5. The Chiefs. Bad as they were, at least they were there, which meant that people actually talked about pro football. Here it's all about Notre Dame. I've just never understood the allure of college football! 6. Good food. It just doesn't exist here. We've had to completely readjust our expectations when we go out to eat! We especially miss Mi Ranchito, Mr. Gyro, and Oklahoma Joe's BBQ. 7. So many more things... just all the perks of being in a bigger city. More and better museums, parks, libraries, events, etc. I want my big city back!